For duty eyewear that performs with style, look to Wiley X P-17 Black Ops Tactical Sunglasses. 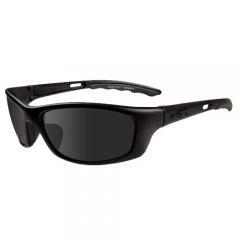 The design features wraparound, shatterproof frames in matte black for maximum protective coverage and optimal peripheral vision. Smoke gray lenses protect wearers from harmful UV-rays. The rubberized nose and temples deliver a secure fit that stands up to high temperatures and high pressure situations. Each pair meets rigorous ANSI Z87.1 safety standards and are fully RX-ready for those needing corrective lenses. Whether on the job or at the firing range, count on the no-compromise, all-weather protection and professional look of Wiley X sunglasses. Love these Wiley X sunglasses.